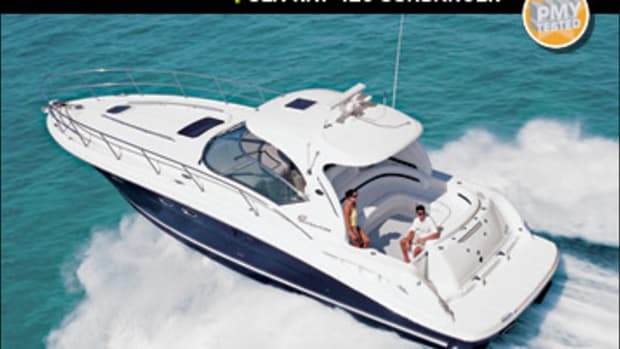 Fun is what boating’s all about. 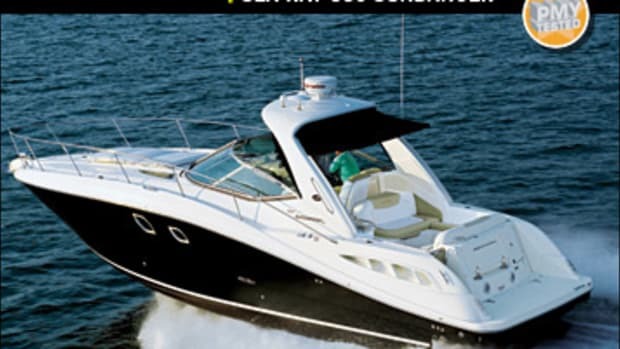 And Sea Ray’s new 410 Sundancer has that concept covered. Back in the day, thanks to what they call bonne chance in southern Louisiana, I crossed trails with a fabulous old Cajun by the name of Justin Wilson. He had a popular cooking show on TV at the time and a bunch of books, cookbooks, and videos on the market. And because we hit it off from the start, he kindly offered to help me with a story I was doing about Louisiana-built boats, Cajun restaurants, and whatever else I could dream up. The old boy proffered one warning, though. Wilson’s pithy admonition has stuck with me, despite the fact that he’s long since faded from the scene, along with his humor and improbable dialect. 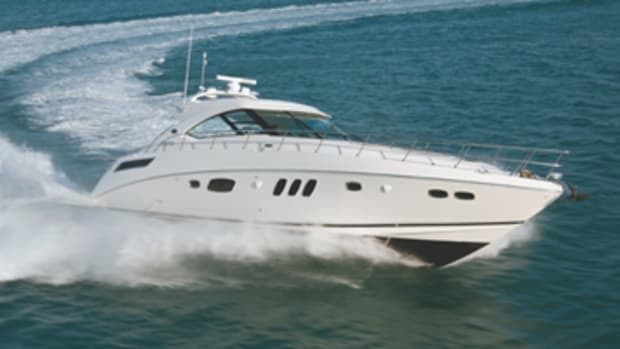 In fact, it came to mind just recently on a brisk day, while I was beelining a brand-new, shiny-blue Sea Ray 410 Sundancer across a creamily whitecapped stretch of the Indian River on Florida’s Space Coast. 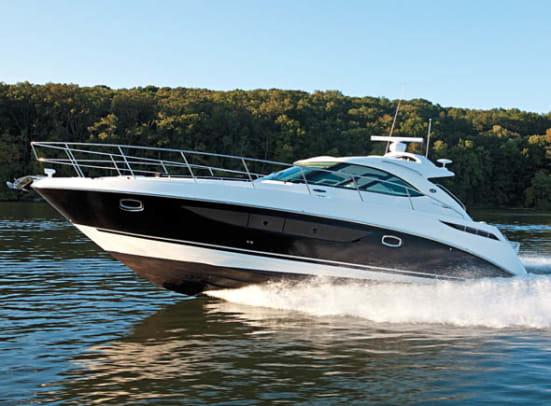 Scott Nault, Sea Ray’s sales manager for sport yachts, grinned indulgently from the 410’s aft-facing, chaise-longue-style passenger seat and tightened his grip on the armrest. What can I say? The young fellow’s known me and my fun-loving persona for a very long time. But hey! We’d already completed the data-collection part of our sea trial, having officially chalked up an average top end of 31.4 knots, a couple of running angles that were a tad high (7.5 degrees at 2000 rpm, for example), and a few sound readings at or near top end that, quite frankly, were a little high as well. And now we were zooming into the dancing-with-waves part, doing stuff you might rightly describe as either fun or, if you tend to be a stick-in-the-mud about such things, a waterborne regime of seemingly odd, sometimes slightly dangerous driving maneuvers, invented to loosely gauge a boat’s performance in open water. 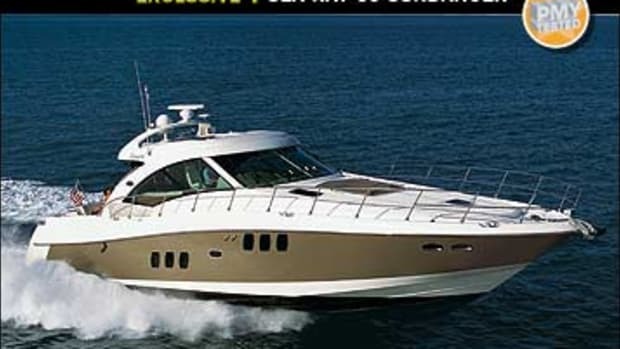 I pulled the throttles back enough to settle the 410 into a cruise speed of 26 knots or so. 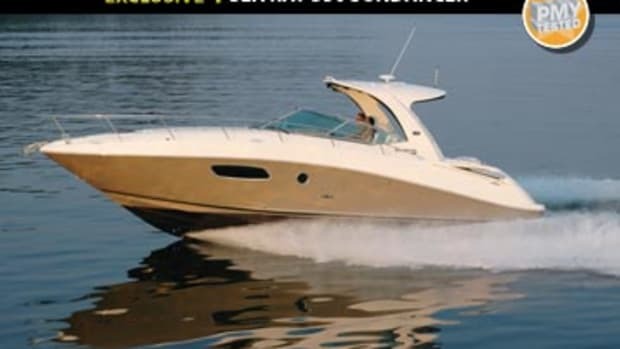 Then, using the rocker switches mounted just abaft the SmartCraft DTS engine control on the shelf along the starboard inwale, I overrode the auto-trim feature of our 375-bhp Cummins Mercruiser QSB5.9-380 Zeus pod powerplants and lowered our running attitude slightly. With interest, I eased the boat into a starboard turn and began tightening, corkscrew-fashion. The result was both instructive and enjoyable. 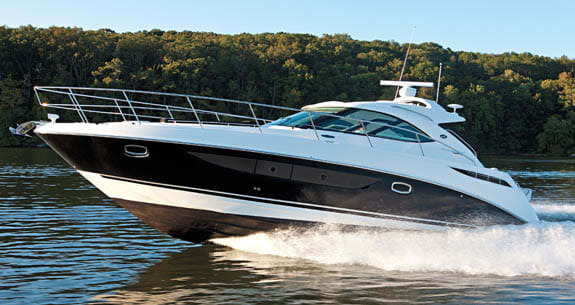 Despite the 410’s relatively heavy, running-attitude-altering powerplant (our pod-equipped test boat weighed approximately 2,200 pounds more than a standard-issue version with V-drive-inboards), she kept her nose perfectly poised above her element. I noted not the slightest tendency to bow-hop as the turn progressed—just the steady thrum of an inboard-heeling momentum. It was cool! Emboldened, I put the boat into yet another turn, only this time I spun her wheel to port with a vengeance, the point being to assure myself that the computer-controlled turning angles dialed into our Zeus pods had been properly set, a critical tweak that prevents outboard-oriented G-forces from feeling (and sometimes being) unsafe at the helm. Whooooeeeee! We came ’round with such confidence-instilling ease I immediately replicated the move, only this time going to starboard, coming away as enthused as ever. Of course, not all that’s fabulous is fast and furious. 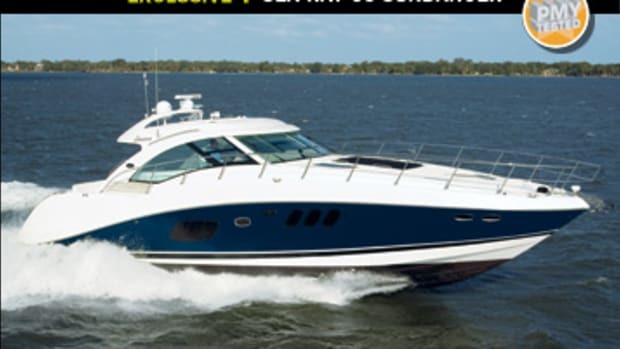 And toward the end of the inevitable and obligatory return trip to Sea Ray’s Merritt Island facility, I toned the speed down, eased into the bayou-like Barge Canal, then idled east for a half hour or so, and finally made a slow, careful turn into the shallows of Sykes Creek. 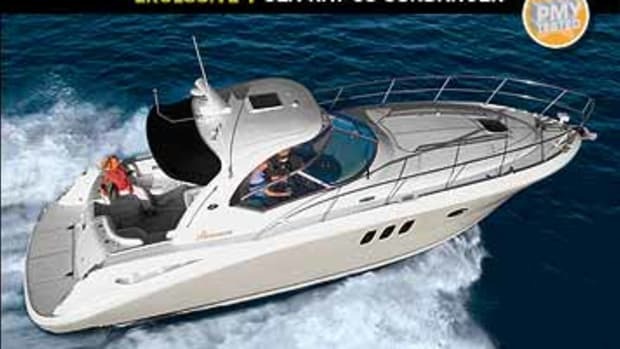 Not only did this leisurely experience give Nault and I a chance to kibitz en route about the stuff going past the 410’s immense side windows, it gave us a genuine appreciation for the optional Cruisair reverse-cycle air-conditioning system in the boat’s cockpit. Toastiness when temperatures plummet can’t be beat with a boathook. And yeah, docking was enjoyable as well. But I’ve got a complaint nevertheless, one that stems from the fact that I, like most people on the planet, am right-handed and, to be painfully transparent, not overly coordinated on the left-handed front. Our 410’s Zeus joystick was mounted well to starboard of the helm, virtually against the starboard inwale, an arrangement that forced me to use my shaky left hand for docking while facing aft. Did I rotate the boat in place and then back her gently into the slip without breaking anything? Yup! Would I have had more fun doing the deed had the joystick been mounted to the left of the steering wheel, so I could have used my right hand while facing aft? Yup again! 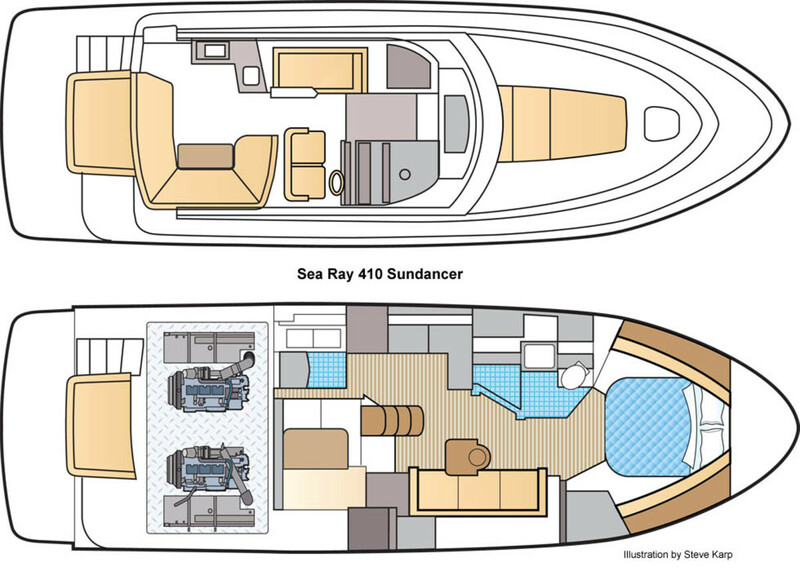 One further bit of niftiness presented itself during my dockside exam of the 410—Nault’s mention of the two options she offers in terms of interior layout. For starters, there’s the standard single-stateroom setup I toured on our test boat, complete with a forward stateroom (with shower-stall-equipped en suite head), a lounge-surrounded conversation pit aft (with curtain, convertible sleeping arrangements, and an adjoining head), and a galley/dinette area in between. Should this arrangement not satisfy, however, there’s an optional layout that closes off the pit with a bulkhead, thereby turning it into a second stateroom with an adjoining head. Let’s face it. 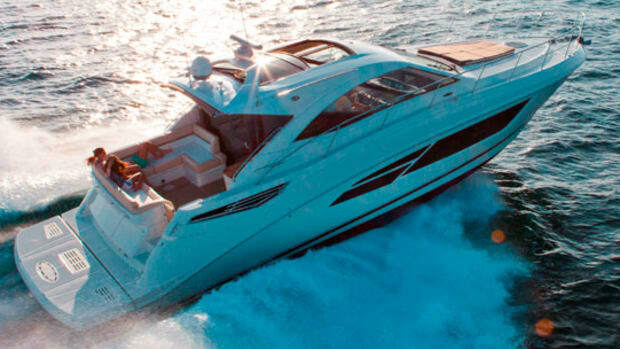 There’s little doubt the choices here are going to help you enhance family fun on the water, whether the focus is on children, grandchildren, guests, or a mixture of all three. Nault and I finished up the day in the engine room, a spot accessed via a ladder and a push-button levitating cockpit sole. In addition to the orderliness of the place, two details stood out. 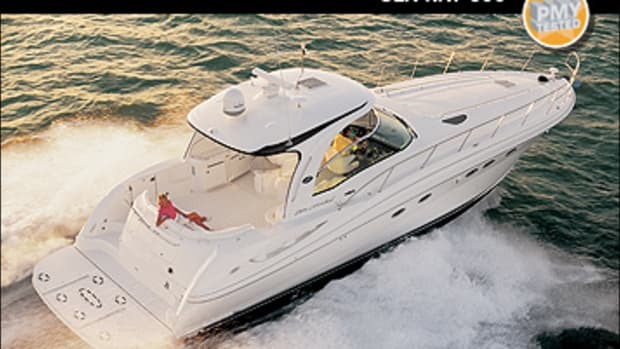 First, Sea Ray’s engineers had encased the Kuuma water heater at the rear in heavy StarBoard cabinetry, a move that facilitated the convenient attachment of all freshwater-related equipment, from filters to manifolds. All water-related stuff in one location—smart! And second, I noticed a spanner neatly secured in a holster within inches of the two main Groco sea strainers. Ever get lost-spanner syndrome precisely when you need to remove a strainer cap in a hurry? Not on this cruiser. “So whataya think?” Nault asked when it came time for us to part company. 130 gal. fuel, 60 gal. water, 2 persons, 40 lbs. gear.